Recommendation: Recommended for those new to the “Butcher Bird”. Geoff Coughlin is a name that will be familiar with a lot of aircraft modellers. His work has appeared in many publications including Tamiya Model Magazine International and previous Osprey Modelling titles. He particularly likes the flying machines of World War II so it is not surprising that he has penned this volume on the Fw 190. Eighty pages make up this title which follows the format of those before it. There are well over two hundred colour photographs, including some wartime shots of the machines themselves. The book entertains its reader with twelve sections although seven would be considered main chapters. A brief run down on the available kits is found in the introduction and the respective merits of these in the four most popular scales are covered. The following two pages deal with tools and materials. These initiate the student with the fundamental items needed to detail the models and replicate the finishes displayed. The core of the book is of course the models. There are six of these, all contained within their own chapter. The projects are based around a particular proficiency and the building of each subject is explained in step by step photographs. 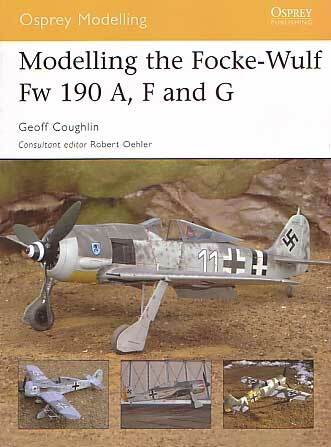 Chapter 1’s mission involves the detailing of the Revell 1/72 scale Fw 190 A-8/R11. The “intermediate” skill level assigned to the model involves some “tidying up” of the basic kit, adding Eduard’s etched metal flaps, and opening the kit’s closed canopy. The same skill level is attributed to the recent 1/32 scale Hasegawa release found in the next chapter. Here the A-5 variant is dealt with and the emphasis is on what happens after the assembly is done. Washes and highlighting make an appearance here as do the finer points in masking and decaling. The first major bit of conversion work comes in the next section. It is Dragon’s Fw 190 G-3 that gets the treatment, with the majority of the kit being a re-release of the original Trimaster offering. A new Cutting Edge cowl corrects a few fit problems and also accurately depicts the scribed latches. Tamiya’s Fw 190 A-3 makes its debut in chapter 5. The importance is on the multi layered paint job of a machine from 6./JG54. The author converts the kit to an A-4 and proceeds to explain his technique to complete this unusual colour scheme. It’s back to the Hasegawa kit for the next two subjects; a winter scheme from I./SG2 and a “Rämmjager” from 5./JG4. Regarding the former, the painting takes centre stage again. The latter sees the introduction of the Eagle Parts resin cockpit set and Fabflight contribute to the conversion of the aircraft to the Fw 190A-8/R8 variant. Eduard lends a hand with photo-etched landing flaps as well as detail for the wheel wells. In keeping with the format of this series, there is a chapter devoted to creating a base. This consists of a nicely done make-shift “lair”, representative of the Russian Front. Finishing off the book, there is the usual section where the reader can find additional information. Here we can also find a list of surviving examples, a brief rundown of available kits, and a representation of the colours used on this aircraft. This is a useful book for anyone that wants to start getting involved in building this aircraft. None of the projects are particularly hard and the step by step photographs will easily guide you through the process. It won’t tell you a whole lot about the aircraft itself though, as the text generally describes techniques that can apply to a whole range of aircraft. What it does do is provide inspiration for the modeller to try their hand at starting a collection of this colourful and popular fighting machine. Recommended for those new to the “Butcher Bird”.